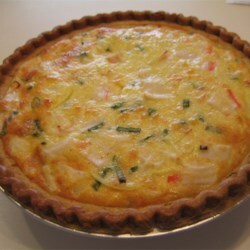 "This is an easy seafood quiche. A wonderful brunch recipe, or can also be a good main course for a light dinner." In a medium bowl, beat together eggs, mayonnaise, flour, and milk until thoroughly blended. Stir in crab, cheese, and onion. Spread into pie shell. Bake for 40 to 45 minutes, or until a knife inserted in the center comes out clean. "Easy and light pasta with tomatoes and garlic. 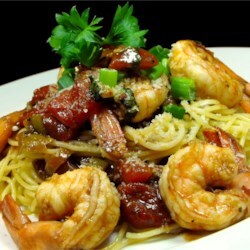 Cooked chicken breast chunks or shrimp can also be added to sauce for a great main dish!" Bring a large pot of lightly salted water to a boil. Add pasta and cook for 8 minutes or until al dente; drain. Pour olive oil in a large deep skillet over high-heat. Saute onions and garlic until lightly browned. Reduce heat to medium-high and add tomatoes, vinegar and chicken broth; simmer for about 8 minutes. Stir in red pepper, black pepper, basil and cooked pasta, tossing thoroughly with sauce. Simmer for about 5 more minutes and serve topped with grated cheese. 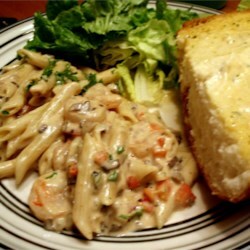 "Yummy shrimp in an Alfredo sauce, with portobello mushrooms and red peppers." Meanwhile, melt butter together with the olive oil in a saucepan over medium heat. Stir in onion, and cook until softened and translucent, about 2 minutes. Stir in garlic, red pepper, and mushroom; cook over medium-high heat until soft, about 2 minutes more. Stir in the shrimp, and cook until firm and pink, then pour in Alfredo sauce, cheese, and cream; bring to a simmer stirring constantly until thickened, about 5 minutes. Season with cayenne, salt, and pepper to taste. Stir drained pasta into the sauce, and serve sprinkled with chopped parsley. Place the bacon in a large pot and cook over medium-high heat, stirring occasionally, until crisped and browned, about 10 minutes. Remove the bacon with a slotted spoon, leaving the drippings in the pot. Set the bacon aside. Stir the potatoes and carrots into the bacon fat. Season with salt and pepper, and cook for 5 minutes, stirring frequently. Pour the juice from the clams into the pot, and add enough water to just cover the potatoes. 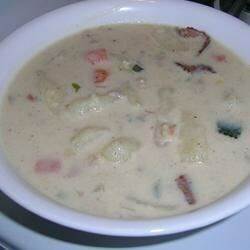 Bring to a boil, then reduce heat to medium-low, cover, and simmer until the potatoes are just tender, 10 to 15 minutes. Gently stir the leek soup mix into the potatoes until no lumps of soup remain. Stir in the clams, reserved bacon, and half-and-half cream. Cook and stir until the chowder returns to a simmer and thickens, about 10 minutes more.